Three legged stools are a metaphor that we use to provide context around our building a relationship with you. Andrew: My father used to milk a cow, without a stool, as he invariably did that out in the paddock. While I learnt how to do the same it wasn't until I was in 4th grade when I learned about why three-legged stools had three legs. 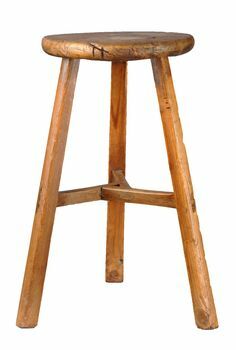 You do know why many stools have only three legs? It's because in times gone by when cows were milked in a shed by hand, the floor area was never flat or level and a four-legged stool was unstable. But a three-legged stool is always stable even if the floor is badly tilted or warped. If you had the choice, wouldn't you want your business seated on a three-legged stool so it could weather any kind of uneven business conditions? When we first get together we conduct a subjective assessment in relation to three core areas (our three legged stool) of the foundation of our relationship. Like in this sense, is about having similar values, ethics and a shared view of what is the potential for the business. If we are to be working together on an intensive basis over an initial three month period then having alignment in this area is paramount. Do you trust us to act in your best interests? Do we trust you to have an open and honest discussion as to how you arrived at the place you are at and any of the foibles the business may have? If not then trust isn't something we have in each other. If either of us does not respect the other, where we have each come from, our respective skills and attributes then the relationship will flounder. Our role as a change agent in your business is to care for the business, absolutley. We work at all times to protect the your business project and those on your team. You receive guidance, assistance and support, as a sherpa, as your business progresses through the pathway of change. That’s how the three-legged stool ties into powerful business relationships. Happy clients, happy facilitators, improved business outcomes. If any one of these three "legs" is short on, or broken then the ability for us to work together to create a bigger future for your business is not likely to happen. PO Box 73, Creswick 3363, Victoria. We are facilitators of change. The processes we work with are designed to impact your businesses. We exist to support you to create a bigger future, whilst building a business that matters. © 2006 - 2018 Growth Point Agribusiness Pty Ltd.